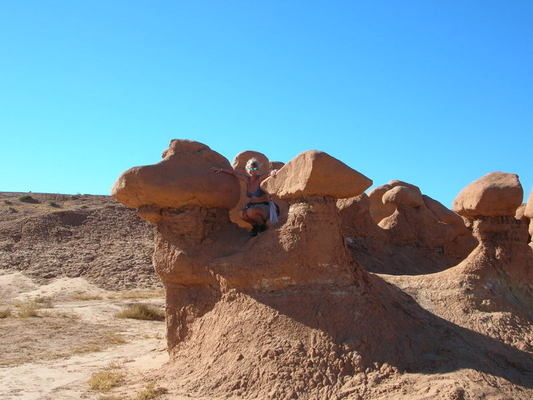 Late last year, I watched ‘Star Trek – Generations’, part of which was filmed in the Valley of Fire State Park in Nevada and it got me thinking about film locations I have visited/stayed in. It also gives me a chance to publish some of the photos I have taken. 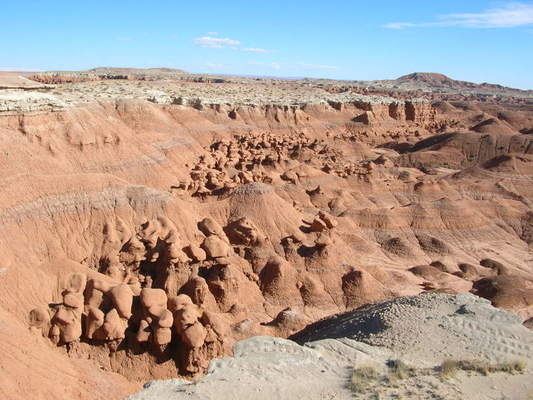 Goblin Valley State Park, UT is located off Highway 24 to the south of Green River and north of Hanksville. Considering its location, we have never been the only ones there. 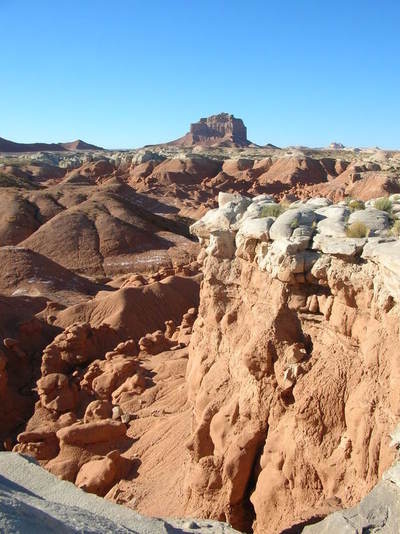 The park has camping and great hiking opportunities. 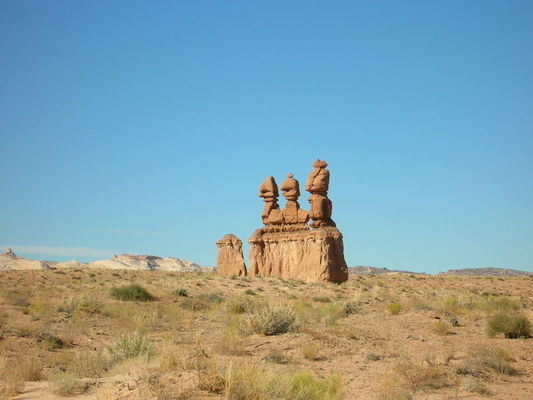 The main feature of the park is the sandstone rock formations that, due to erosion, give the appearance of hundreds of hoodoos that look like small goblins. 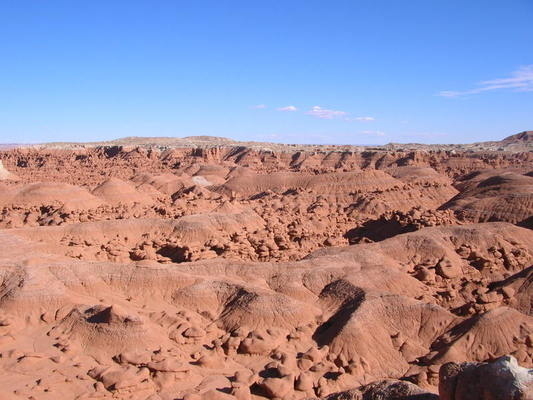 It makes a great maze-like playground to wander around. Film: Galaxy Quest (1999) - The alumni cast of a cult space TV show have to play their roles as the real thing when an alien race needs their help. The film stars Tim Allen, Sigourney Weaver & Alan Rickman. 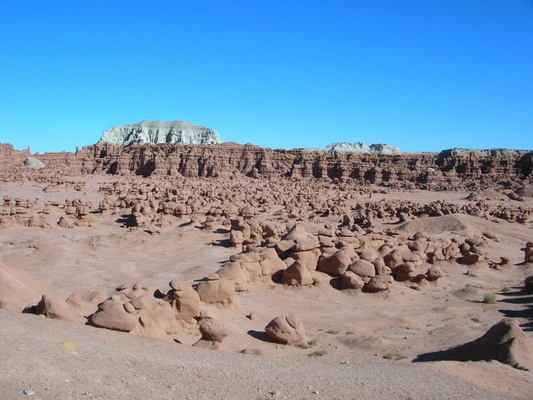 In search of a beryllium sphere (need to fuel the spaceship), the crew travel to an alien planet (Goblin Valley SP) where they are attacked by a huge rock creature. I don’t remember seeing a mine when we were there. One vivid memory I have of one of our stays in the campsite, is being engulfed by a dust devil! We had spent the day hiking a nearby slot canyon and had returned to the campground for a shower and a well-deserved beer (aren’t they all well-deserved). Having had my shower, I sat on a rock with my beer. 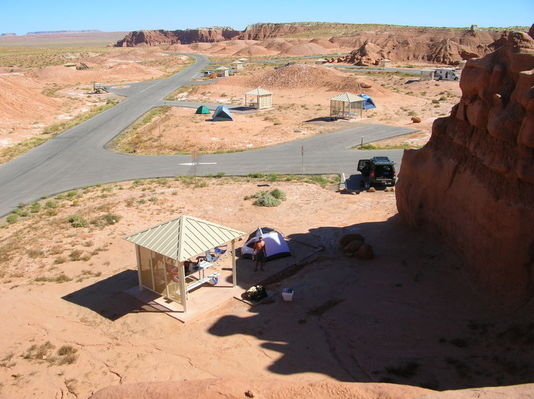 The campground was located in a natural amphitheatre-shaped bowl. I was suddenly aware of an increase in wind noise and sat mesmerised by a funnel of dust heading my way. All too soon, I was in the middle of the storm. I balled myself up on the rock and waited for it to pass. As soon as it had arrived, it was gone. 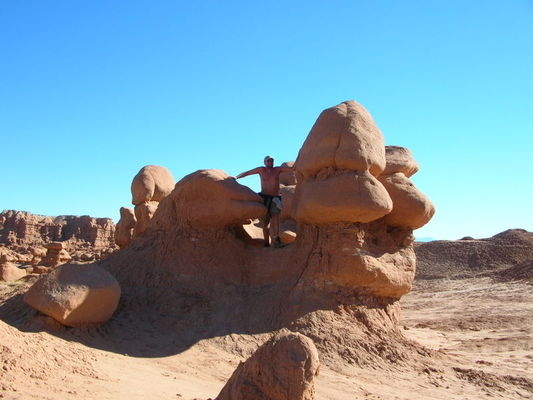 I had sand in every orifice – I was in need of another shower. I looked around the campground; it was littered with stuff blown around by the wind. Even Tumbleweed had been blown out of the truck. Roy came out from the shower block wondering what had happened. We spent a few minutes clearing up and returning items that didn’t belong to us. It was quite a talking point.